We're previewing the top returning track and field athletes across all divisions for the upcoming 2019 season and we're kicking things off with the boy sprinters in the smallest schools. Thatcher Seniors Riley Morris and Luis Lopez-Aguilar are set to return and dominate the 100m and 200m meters respectively. Morris and Lopez placed 5th and 6th respectively, in the D4 Boys 100m and they're the top returners in the State for the 100-meter dash with times of 11.22 and 11.32 from the AIA Track and Field State Championships back in May. In addition to being a State Champion in both the high and intermediate hurdles, Lopez-Aguilar ran a PR of 22.98 in the 200m dash final at State. Then there's Austin Tewalt (Anthem Preparatory Academy, Jr.) who finished 3rd in the D4 Boys 400m final, and 4th in the 200m. His 400m PR of 50.46 from the Red Rock Invitational ranks him as the top returner among Division 4 boys. He's also ranked as the no. 2 returner in the 200m dash, behind Lopez-Aguilar. 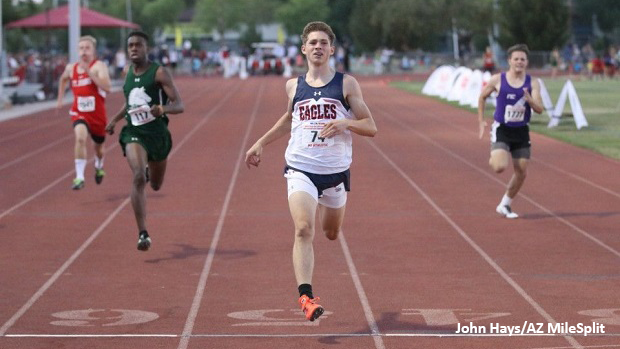 Have a look at the Top 100 Returning D4 Boys in each of the individual sprints.